After a grueling, three-hour heads up match against Todd Brunson, Adam Friedman is the owner of a World Series of Poker gold bracelet. 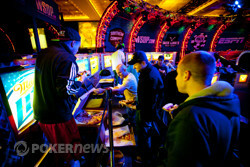 Day 3 started with 19 players, including Phil Hellmuth and Phil Ivey, who were looking to make history. For Hellmuth, it would’ve been his twelfth bracelet, extending his lead over Doyle Brunson and Johnny Chan by two. For Ivey, it would be his ninth bracelet, putting him three behind Hellmuth. It would also earn him a lot of money in bracelet bets. Hellmuth didn’t even make it to the final table however - Friedman, who entered the day as the chip leader, eliminated him. Against Hellmuth, Friedman had a sixty-five low on fifth street, and if he picked up a diamond on seventh, he would scoop the whole pot. His downcard was indeeed the , and Hellmuth was left with very few chips. A few hands later, Friedman eliminated Hellmuth with aces up. “I thought this was the one,” Hellmuth told his wife before heading off to the cage to pick up his money. Within 20 minutes, Brian Twete was eliminated, and we had an official final table. 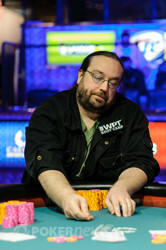 Friedman was still in the lead, and John Monnette – who’s already won a stud bracelet at the 2012 WSOP – was second in chips. Monnette eliminated Kenney, Friedman crippled Ivey, and then Brunson put the finishing touches on the eight-time bracelet winner. Zimnan Ziyard hit the rail next, followed by Sven Arntzen, and then we were four-handed for nearly an hour (not including the dinner break). When the dinner break concluded, Nikolai Yakovenko was crippled by Monnette. Monnette made kings and queens, and despite having a board, Yakovenko couldn’t make a low to chop. He was later eliminated by Friedman, who was dealt split aces and improved to aces and jacks on sixth street. 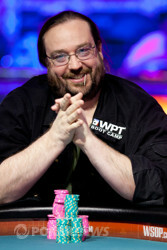 Friedman had more than half of the chips on the table when three-handed play began, and remained in the lead for nearly two levels. Then, just when Doyle arrived to sweat his son, Todd caught fire. His stack nearly tripled in an hour, and after he eliminated Monnette in third place, Brunson had over two million chips. Despite being out-chipped by a 2:1 ratio to start the match, Friedman didn't quit. Rather, he roared back and snatched the lead away from Brunson. The two then traded pots for the better part of three hours, until Friedman strung together a few pots and took a commanding lead. On the final hand, Brunson was dealt split tens, but was behind Friedman's concealed jacks. 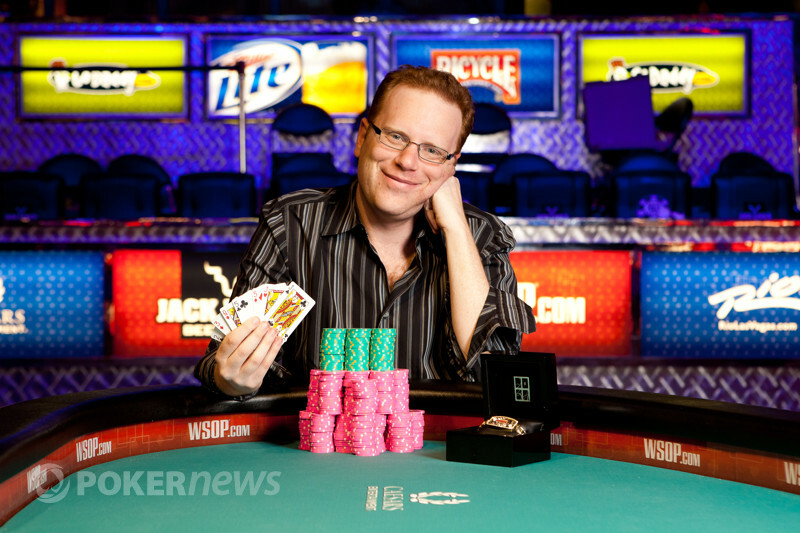 Friedman held to win his first live tournament since March of 2009, and of course, his first career WSOP bracelet. Thanks for sticking with us through the entire day, and make sure you check back with us for all of your up-to-the-minute updates from the 2012 WSOP. 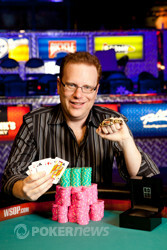 Congratulations again to Adam Friedman, and good morning from Vegas! Friedman brought it in, Brunson completed, and Friedman called. Brunson led out on fourth and fifth street, Friedman called both bets, and the two checked on sixth. On seventh, Brunson check-folded, leaving himself with only 600,000 chips. On the final hand, Friedman brought it in, Brunson completed, and Friedman called. Brunson check-called a bet on fourth street, and on fifth street, after a series of raises, he was all in. Friedman was ahead with a buried pair of jacks, and Brunson needed to improve on sixth or seventh. Both players bricked on sixth, and Friedman made two pair on seventh. Brunson was drawing to a ten and a ten only, and on seventh street he was dealt a meaningless . After playing heads up for three hours and change, Brunson must be disappointed, but a $166,269 score ain't too shabby. Brunson called a bet from Friedman on sixth street, and both players checked on seventh. Friedman rolled over for a pair of tens, and won the pot. 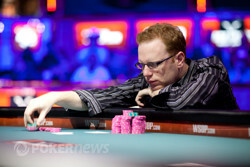 Friedman also won the next pot with a superior pair, and now he has the massive lead. Brunson brought it in, and Friedman called. Both players checked on fourth street, and Brunson check-called a bet on fifth. Friedman check-called a bet on sixth, and then led out on seventh. Brunson called. Friedman tabled , and scooped the pot. Todd Brunson scoops a monster. Brunson brought it in, Friedman completed, and Brunson raised. Friedman called. Friedman led out on fourth and fifth street, Brunson called both bets, and Friedman slowed down on sixth, check-calling a bet from Brunson. Friedman check-called another bet on seventh, and Brunson tabled for a pair of sixes and an eighty-six low. Friedman mucked, and Brunson now has a massive lead. About an hour ago, we heard the rail shouting about pizza. The Poker Kitchen has been closed for a few hours now, so we didn't know what they were talking about - we just assumed that they were becoming a little loopy as the hours passed. That's until a pizza delivery man came bounding into the deserted Amazon Room with five pies in his arms. The entire rail swarmed the pizza boxes, and the essence of cheese, pepperoni, and tomato sauce is now lingering in the air. The rail is now a bit chippier than before, but it's still very late, and the food will only fuel them for so long.